After learning the delicate craft of European artisanal cheesemaking on a family farm in Brittany, France, in the 70s, Allison Hooper was working as a state dairy lab technician in Vermont when she got a call that would materially change her career path. Bob Reese, the marketing director of the Vermont Department of Agriculture, was on the hunt for chevre to serve at a special state dinner. Today, that would seem like an easy enough request but in the 80s, artisan cheesemaking had yet to find its footing in America. 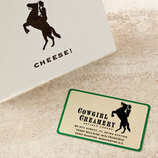 Allison made the chevre herself and it was so successful that Bob and Allison ended up founding the Vermont Butter and Cheese Company. Over twenty years later, the company, now known as the Vermont Creamery, is still making artisanal dairy products in the European tradition while championing local farms. 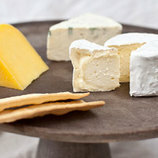 Made from the same recipe as Vermont Creamery's Bijou, Coupole is named for its shape: a rounded dome. 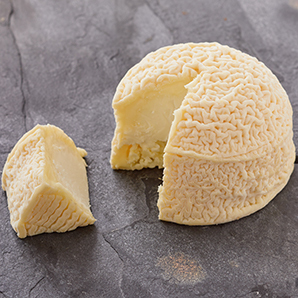 Dense and creamy, Coupole is a touch milder in flavor than Bijou and Bonne Bouche. It also has a mild, sweet, wrinkly rind that grows more intriguingly yeasty as the cheese ages. Coupole's paste is clean and citrusy, which contrasts with the stronger flavor of the rind.